A rather well-known computer network engineer once commented that cryptocurrencies as a whole were likely to experience a catastrophic crash from which the entire space will never recover. “There’s just no reason to move forward with a new paradigm when the current one works so well, people are not going to switch to a brand new way of doing things, and when the bubble pops, they’ll keep on using what they always have, cash and plastic cards.” This all sounds very reasonable, and very concerning to us enthusiasts, does it not? Now, would it sound less reasonable if I was to tell you to replace crypto with the internet and wallets with wireless networking? Would it shock you, even more, to realize those comments were made by the co-founder of Ethernet, Robert Metcalfe? Looking back now, those comments seem incredibly short-sighted, and people are keen to mock them, but considering the source and how revolutionary his invention was, many would struggle to understand how someone that was so progressive and inventive could be so limited in their thinking. The truth could not be any more straightforward: it’s incredibly hard to see the forest for the trees, or perhaps more aptly, to see the trees from the forest. Now, why does this matter to us, as people heavily vested in the crypto world, who readily believe that crypto is the future? The answer lies in the world we operate in, surrounded by critics and vehement hate an idea that seems to be so progressive. Many struggle to understand how people can’t see the possibilities offered with cryptos, especially considering the same criticisms were lobbied at the same system they now use to criticize it! All too often, this can even make us question our views. When so many of our peers ridicule something we are vested in, it becomes common to second-guess your choices. Unfortunately, perspectives on emerging technologies have a history of being surrounded by critics — from the most unlikely of sources. If you’ve spent any time in tech forums or frequent Reddit, you may have seen a somewhat infamous article from 1995 by Clifford Stoll, a pioneer in digital investigations and securities and most known for his historic capture of notorious hacker Markus Hess. Many would think Stoll would be a massive proponent for the digital future, and yet he had some of the harshest criticisms about it. This article is one that gets recycled out every few years on a slow news day to mock, so I don’t see any reason against bringing it up today in a different light. Instead, I merely want to take a look at one of his most significant points he was so stuck on. 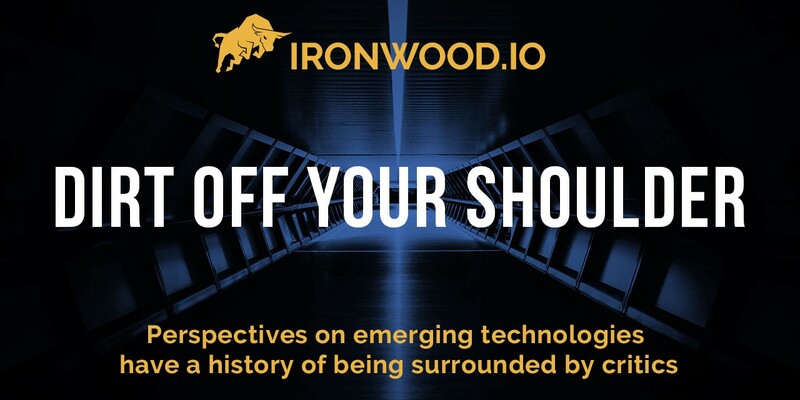 When commenting on the viability of data on the internet, Prof. Stoll talks about how it’s a “wasteland of https://medium.com/ironwood-rg/free-download-crypto-assets-trading-investing-playbook-7befc7e29761unfiltered data,” and the difficulties associated with trying to find out information about one historic battle and being utterly confounded at the data. Yet I’m sure any jaded network administrator from the early days could easily tell you that was simply his misuse of the systems at hand. He simply used the wrong channels and preconceived notions of how hard it was to begin with to construct a flawed argument based mostly on a lack of education. I’m sure this sounds rather familiar to anyone who’s tried to explain the benefits of crypto technologies to anyone whose only interactions with it has been a 10-minute news report on the television. We often simply lack the perspectives needed to see the full scope of things available to us. That argument presented to a vast majority of the population today would seem laughable, as the majority of internet-using population has a much firmer grip on the use of the internet to find anything they seek, and while surely the internet as a structure has had massive improvements since 1995, just as important is the gain in general education on its use. In just 20 years, we went from the internet being deemed shady and something you should never think about using your credit card on to becoming attached at the hip with it. Twenty years was all it took for acclaimed experts to be nullified in their views, wholly proving, without a doubt, that today’s experts on related fields often don’t even begin to have a clue about the future, as they’re often misguided by engrained ideas and learnings from their own fields. So at the end of the day when you feel conflicted and down about your choices regarding crypto because of the negative noise around you, I think there’s only one course of action. Define to yourself why you think this tech is valuable, why it matters, and what it can do for the world. No major shakeup has ever happened calmly. Every forward thinker has been criticized by the average citizen and the “elites” and “experts” of their day. People will throw a lot of arguments at you about success fallacies of all the failed techs that didn’t make it, and it’s just our confirmation bias thinking that our tech will be one of the big ones. And they might even be correct. The only thing we can know for certain is that we know nothing for certain about the future of technologies, but what we do know is what we can understand about the tech itself. We can see obvious massive advantages and changes offered by crypto, and the benefits therein offered to the world. And I think the most important thing we can do is to remember that. Don’t let the negativity drag you down, and remember this isn’t the first time we’ve endured a major crash — and it won’t be the last.